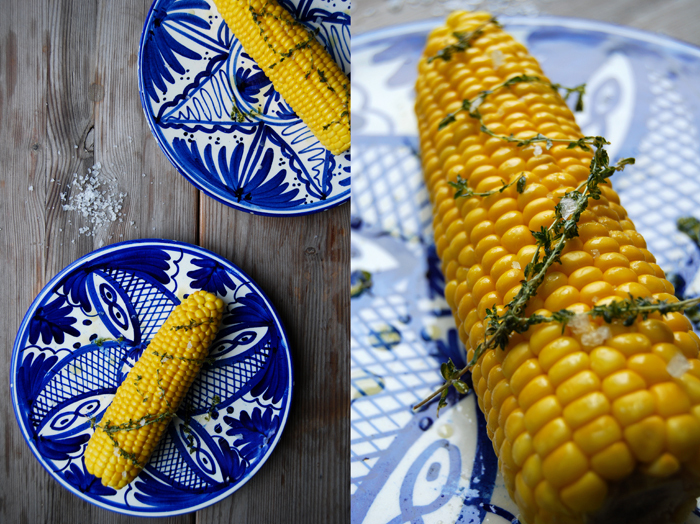 Golden corn on the cob is one of my culinary highlights in July! The temperatures rise (normally, not this summer), the wheat starts to turn the countryside to gold and the corn is high. We used to play in the corn fields when we were young – although we weren’t allowed, it’s the perfect place for hide and seek, especially if you’re only half the size of a corn plant. 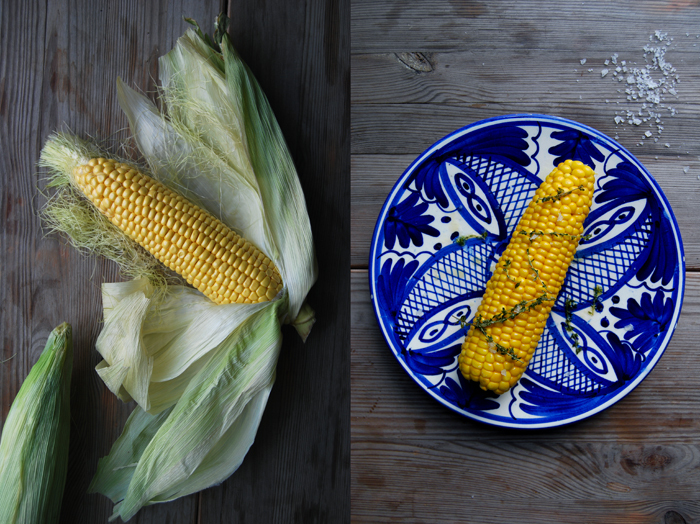 I like to cook sweetcorn in sugared water until the kernels are tender but still crunchy, just soft enough to bite them off. 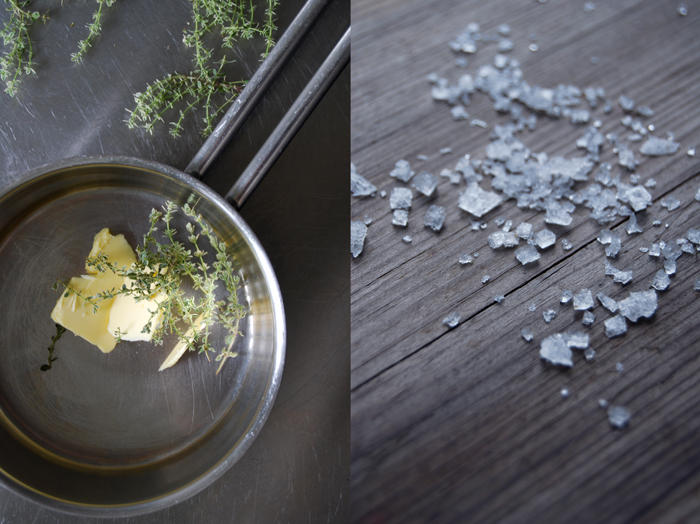 I glaze the bright yellow with melted lemon thyme butter and sprinkle it with sea salt. 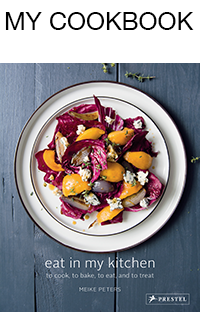 That’s all it needs, this meal is about purism! Sometimes I cook a few more and cut off the corn, they stay fresh in the fridge for a couple days and are nice in salads or on pizza. Everytime I hold a hot, buttery cob in my fingers and I taste their pure sweetness I feel like a child again – this is fun food! In a large pot, bring lots of water to the boil, add the sugar and sweetcorn and cook on a medium-low heat for 10-20 minutes until the corn is tender and you can loosen a kernel with a fork. Melt the butter in a sauce pan, add the thyme and cook on a medium heat for about 2 minutes. The leaves shouldn’t get dark, just soften a bit. 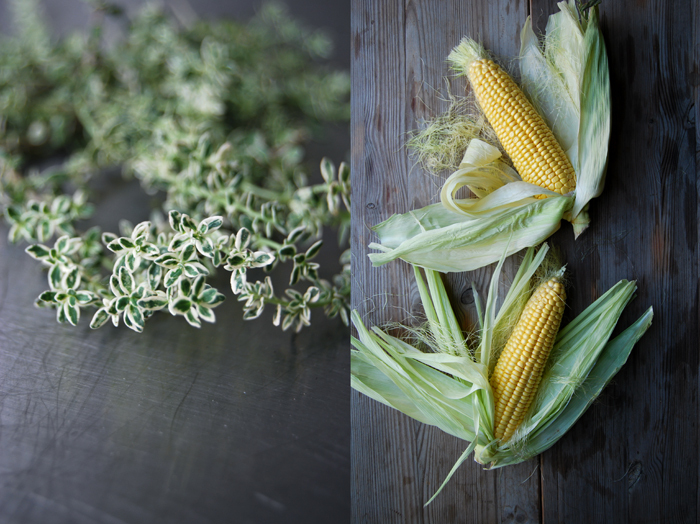 Coat the sweetcorn with the melted butter and sprinkle with the sea salt and thyme. Enjoy! Corn, to me, signals summer has arrived! Beautiful photography, Meike. Thank you Marigene, that’s true! If only the weather would say the same, it’s been gray and rainy here.